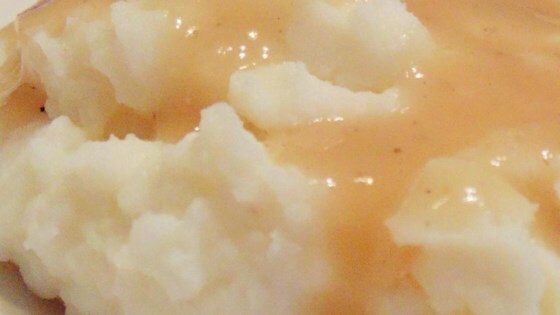 "This recipe is a copycat version of KFC®'s gravy." Melt 1/2 of the butter in a skillet over medium heat. Add onion; cook and stir until translucent, about 5 minutes. Heat remaining butter in skillet over medium heat; whisk in flour to form a thick paste. Continue cooking, whisking constantly, until flour has turned golden brown and begins to smell toasted, about 20 minutes. Whisk water, beef bouillon, and chicken bouillon into skillet until no lumps remain. Add pepper and bring mixture to a boil. Cook and stir until thickened to gravy consistency, 8 to 10 minutes. See how to make creamy chicken gravy from scratch. The best way to make a good roux is to use a whisk and make sure the butter does not burn. Ummmm, definitely not KFC gravy. Not even remotely close. Not even close to KFC gravy. I could buy brown gravy mix that would come closer.